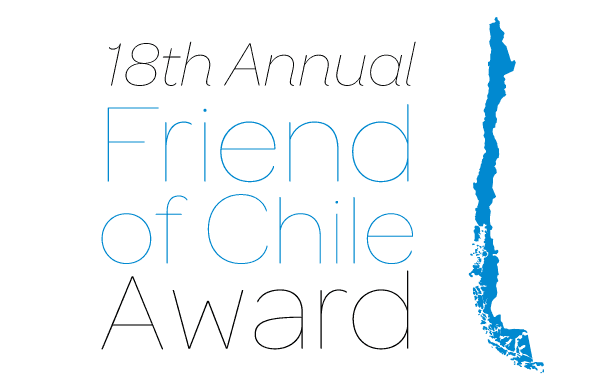 Chilean Wine Tasting & Reception at 11:30 a.m.
We are excited to present the honorees of the Chilean & American Chamber of Commerce’s 18th Annual Friend of Chile Awards Luncheon. These two honorees are committed to our mission and exemplify the vision of the Chilean & American Chamber to strengthen the relationship between Chile and the Greater Philadelphia region. The Chamber will proudly honor them on Thursday, December 3, 2015 at the Hyatt at the Bellevue in downtown Philadelphia. Derrick Jenkins, Vice President of Produce and Floral for Wakefern Food Corporation, will receive the 18th Annual “Friend of Chile” Award. Derrick Jenkins joined Wakefern in 1982. He started his career as a temporary Junior Accountant and was then hired a few months later as a full-time Junior Accountant in Produce. Derrick remained in Produce, rising through the ranks in the division and working as an Analyst, Buyer, Produce Manager, Senior Produce Manager and Procurement Manager before being named Vice President of Produce and Floral. The successful Produce and Floral Division Derrick heads today meets logistical demands, bringing products from every part of the region, country and world to grow business. Produce ships seven days a week to all stores, and the division also has buying offices in California and Florida. Derrick was the 2013 recipient of the Avis Spirit Award from the Susan G. Komen North Jersey Affiliate for work he has done through Wakefern—donating flowers, food and money to raise funds for breast cancer treatment and screening programs. Derrick has served on the board of the Produce Marketing Association (PMA) for several years and has been a huge advocate of the Eat Brighter Campaign, an initiative that encourages children to consume more fruit and vegetables. Ralph Hackett, Co-managing Member of Dayka & Hackett LLC, will receive the 2015 “Lifetime Achievement” Award. Ralph Hackett has had a professional career spanning forty years, thirty of which have been focused on the fresh produce industry. His industry experience began in 1985, when he joined Cal Fruit Suma, starting out as Controller then quickly promoted to Operating Manager. Cal Fruit Suma, following its 1985 startup, was amongst the leading US importers of Chilean fruit from 1987-1989. Ralph has been the successful spearhead of multiple distinguished companies in the fresh produce industry, including Suma Fruit International, Pacific Trellis Fruit, and his current enterprise with business partner Tim Dayka, Dayka & Hackett LLC, which is headquartered in Reedley, California and has a full service regional office in operation at the Port in Wilmington, Delaware. A native Philadelphian, Ralph is an alumnus of Temple University and Girard College, where he was given the Award of Merit in 2015, an award granted to Girard College graduates that support the school and excel in their chosen field. Dayka & Hackett LLC supports over 20 charities annually, and Ralph and his wife of 30 years, Lisa, are active fund raisers for the Fresno Boys and Girls Club. We hope that you will consider joining Chamber members and other business leaders in honoring our award recipients and recognizing their contribution to the economic relationship between Chile and the Greater Philadelphia region.